If you have a cat then you know that it’s important to find the perfect care for them when you go away on holiday. 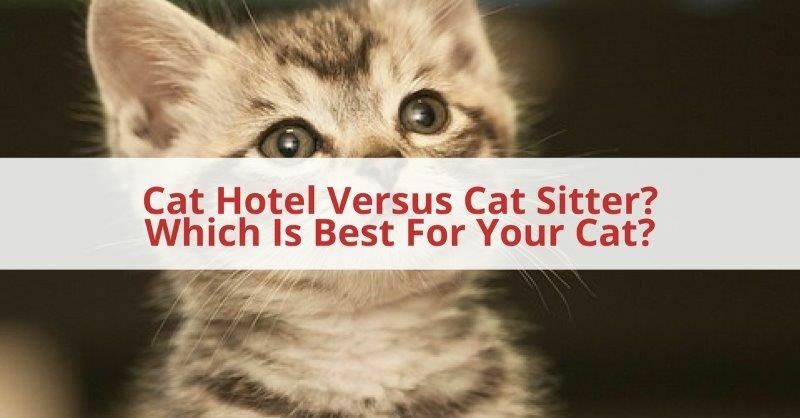 But how do you know whether a Cat Hotel or a Cat Sitter is right for your cat? In this article, we talk about what each of the services offers and which is best suited to your cat. A Cat Sitter, or a Pet Sitter, is someone who comes to your home to take care of your pets when you can’t be there. The main benefit of using a Cat Sitter is that your cat doesn’t need to go anywhere. There is no need to transport them from home to a facility, no screaming in the back of the car in protest and most of all they are happy at home doing what they normally do. A Cat Hotel, or a Cattery, is a facility that you take your cat to when you travel away. It’s usually purpose built and houses several cats in individual cages or rooms. There are varying different standards when it comes to Cat Hotels, some being quite basic and others being more like a 5-star hotel for cats. All cats are not created equal! Therefore, it’s important to consider the needs of your own cat when you decide which is the best care option for them. For my cat, there is no doubt that a Cat Hotel is not right for him. He doesn’t like to go in the car and he likes the open spaces of where we live. Then he might not do well home alone. He may be better in a facility where there are other cats around him. As I mentioned it’s important to weigh up the pros and cons of each service and see which matches best to the needs of your cat. Pros and Cons of a Cat Sitter? As with any service, there are pros and cons, and we strongly recommend that you check out the different options for your cat. If you use the services of a Cat Sitter your cat gets to stay at home in their familiar surroundings and stick to their normal routine. There is no change to their feeding routine, their sleeping space or the environment they are in. A lot of cats do better when they stay in their own familiar environment. It’s less confusing for them and more reassuring. Most cats do not like traveling in the car. As soon as you get the cat carrier out they are gone, hiding from the thought of that dreaded trip. It’s unclear if they associate a trip in the car with trips to the vets, but I have never met a cat that likes to hop in their cat carrier and be taken in the car. When you hire a Cat Sitter that is coming to your home each day you are giving your house that looked in feel, meaning that anyone passing is not alerted to the home being empty. Cons of Using a Pet Sitter. As with any service provider, you do need to give them access to your home. Much like you would a cleaner, a plumber or a builder. This doesn’t always suit everyone, but your Pet Sitter is an animal lover and is there to take care of your pets. What If My Cat Doesn’t Like Strangers? We get that not every cat will want to play with us. Some cats take a while to become friends with us and will be a little reserved and some just might never want to play with us. We will never stress your cat out by insisting they play with us or by trying to make them sit on our knee. Our primary concern is that your cat is happy and healthy – if they don’t feel like playing then that’s fine with us. How Much Does a Cat Hotel Cost? A Cat Hotel, or Cattery, will vary in price depending on the standard of service and the facilities/care that your cat will receive. Some will be as little as 7-10 euro per night, with others being 20 euro plus per night. Most have restrictions around drop off and collection times, meaning you need to plan when you drop off your cat around your trip times. A Cat Sitter will vary in cost depending on whether you are asking a local freelance Cat Sitter or a Professional Business providing Cat Sitting services. You can find out more details about our Cat Sitting Rates. Want more information about our Cat Sitting Services? Get in touch to find out more.